Firefighters were called to Rinnes Drive in Lossiemouth at 3.30pm, where they discovered a smart car engulfed by flames which were rapidly spreading to a Fiat 500 car and a Mercedes transit van. The crews prised open the rear doors of the van amid fears that the flames could reach gas canisters suspected to be inside and cause an explosion. Teams from Elgin and Lossiemouth spent an hour getting the flames under control, and all three vehicles are understood to have been damaged beyond repair. A police spokesman confirmed that one person had been arrested in the aftermath, and a witness described seeing two youngsters being taken away in a police car. It is understood that the vehicles belong to Duncan Isaac, who runs the Royale Meal catering firm and lives in the area, but Mr Isaac could not be contacted last night. The alarm was raised by 12-year-old Jamie Reid, who spotted the smoke while outside playing with friends. The Lossiemouth High School pupil described seeing “tyres popping” and the windows of the smart car explode as the heat of the flames grew more intense. Jamie said: “At first we saw dark grey smoke, and as we went over to see what it was we started to notice it getting a bit blacker. “We realised it was coming from behind a garage, and it was a car on fire. 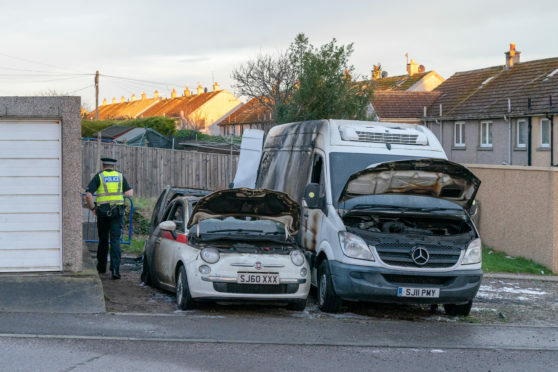 The youngster phoned his mum, Rhianna Reid, after dialling 999 and she raced back to their home on nearby Dunbar Street and stopped other children from getting too close to the burning vehicles. Jamie added: “Shortly after the firefighters got here the windows on the car at the back exploded. Mrs Reid added: “I am so proud of Jamie for acting so quickly, it could have been a lot worse if he didn’t know just what to do. The smart car was reduced to a blackened shell by the ferocity of the blaze, while the rear of the white Fiat 500 was badly burned. The driver’s side of the van was charred and the rear doors showed signs of being bent after being forced open by firefighters. A police spokesman confirmed that one person had been “apprehended” and that specialist officers were investigating the cause of the blaze last night. A spokeswoman for the fire service added that crews used four sets of breathing apparatus and two hose reel jets while dealing with the incident.